Hello everyone! Welcome to the June 29th edition of the Tuesday Couch Potatoes. Wahhh!!! I am running late again for my TCP entry. My apologies! So many things happening all at the same time and the summer heat is making me weak. Anyway, on to our theme for this week: Matt Damon Movies. I know you all love the guy. He is just such a great actor that you just can't help but watch his films. It was Good Will Hunting that launched him in the movie industry but he is a very versatile actor, playing a different variety of roles but he is famous for the Bourne series, Ocean's trilogy and Saving Private Ryan. Aside from him being a really good actor, I find his nose very attractive. I don't know... there is just something about his nose that is charming and boyish at the same time. Hehe! 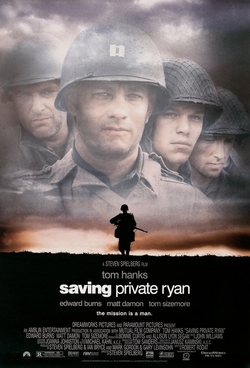 And without further ado, my pick for this week is Saving Private Ryan where Matt Damon plays the roles of Private James Francis Ryan, Perhaps many of you have already seen this movie but it was one of the many war movies that I really loved watching. It has got lots of drama and is an attempt to save the last of the Ryan brothers who has gone in the French countryside. Truly, in the Last Great Invasion of the Last Great War, The Greatest Danger for Eight Men was Saving... One. Thank you for joining us on TCP this week. Next week, July 6th, we will start another whole new month for TCP and our theme will be: Angels. Hope to see you all again next week my dear Couchers! Till next Tuesday, take care and Happy TCP! This is one of my husbands favorite war movies. He has its CD and watched it for 20x I think.lol! Nasan ang Mclinky mo..di ko mailink.. I have seen that movie too, di ko nalang ma recall kung ano ang story..
We have joke about the title of this movie sa atin diba instead of saving private ryan, they joke it into saving ryans private hehe sowe po. Anywho, I have seen this movie and it's very good. nakakaiyak. Great pick Kikamz.